We offer a large variety of robust high quality clamping tools for industrial utilization. Mechanic and pneumatic clamping systems guarantee high security standards during usage as well as processing of workpieces and assemblies. Our clamping systems fix Workpieces on welding devices and workbenches and are easily adjustable and applicable. High-performance clamping techniques ensure stable positioning and hinder sliping out of place during further processing and carrige. Our lever clapms with self-locking effect adapt automatically and hinder unintended opening. Temple clamps and hook type toggle clamps seal the opening safely. We offer vertical acting toggle clamps or push-pull type toggle clamps for manual use. Clamping elements and horizontal acting toggle clamps are perfect for further processing of products as they help fix workpieces onworkbenches. Pneumatic toggle clamps, pneumatic lever clamps and pneumatic roatating clamps support with efficient leverage effect and adapt to clamps and clamping claws of all sizes and forms. 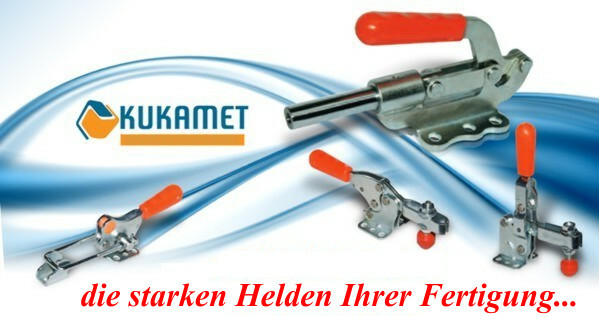 The toggle clamps and power clamps of our brand KUKAMET are produced in europe. This enables us a cost-efficient high quality production. Lean distribution channels make it possible for us to offer toggle clamps and pneumatic clamps for lower prices than our competitors. We keep 90% of our products in our warehouse in Wuerselen, Germany. If the desired product is in stock we will deliver it within two to three working days.